Artistic Artifacts offers BERNINA Sewing Machine Mastery Classes, BERNINA Embroidery Machine Mastery classes and BERNINA Serger Mastery Classes. If you purchased your BERNINA sewing machine, embroidery machine or serger from Artistic Artifacts, your Mastery Classes are FREE! Contact us to reserve your space and select your class date. Those who did not buy their machine from Artistic Artifacts are welcome to purchase registrations for our Mastery Classes, which are held in our Alexandria, VA shop. See below for registration links or visit our Classes page. Part of our series for owners of any BERNINA sewing machine from the 3, 4, 5, 7 and 8 series, this class is designed to familiarize you step-by-step with the operation of your machine. This class includes useful information about fabric, needles, thread, presser feet, and all the parts that came with the machine. Included in the class is a workbook from BERNINA. This Sewing Mastery Class module is free to those who bought their machine from Artistic Artifacts. If you bought your BERNINA sewing machine elsewhere, the cost of the class is $190 and you may register and pay securely using the class links below. The Embroidery Mastery class contain a series of exercises intended to familiarize you with the features of your new BERNINA embroidery module. In addition, you will learn about needles, threads, stabilizers, embroidery hoops and accessories, all of which will increase your knowledge of sewing and assist you in achieving success in all your embroidery endeavors. Once you have completed the exercises designated for your BERNINA machine, the workbook (included with the classes) is a wonderful reference guide to use as you explore the creative possibilities your embroidery machine affords. This Embroidery Mastery Class module is free to those who bought their machine from Artistic Artifacts. If you bought your BERNINA sewing machine elsewhere, the cost of the class is $135 and you may register and pay securely using the class links below. This 4-hour class covers the basics of serger use. Learn how to thread the machine as well as how to manipulate the tension, stitch length and differential feed. This class will give you the information and confidence you need to drag your serger out of the closet! All brands welcome in class; your serger does not have to be a BERNINA. 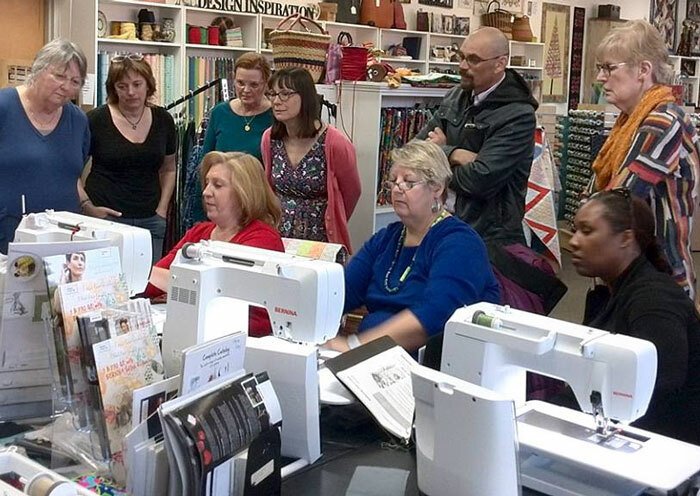 This Serger Mastery Class is free to those who bought their machine from Artistic Artifacts. If you bought your BERNINA (or other) serger elsewhere, the cost of the class is $75.